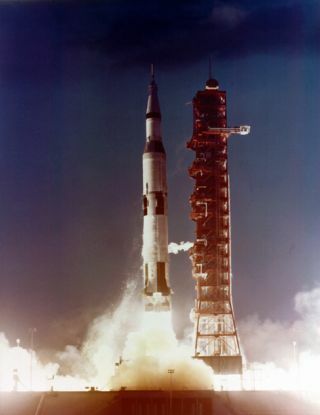 Apollo/Saturn V pictured at the first unmanned test flight. In this historical photo from the U.S. space agency on Nov. 9, 1967, Apollo 4, the first test flight of the Apollo/Saturn V space vehicle, was launched from Kennedy Space Center Launch Complex 39. This was an unmanned test flight intended to prove that the complex Saturn V rocket could perform its requirements. All three stages separated successfully and their engines performed as planned. The third stage also restarted in orbit, which was a requirement for lunar missions. At the end of the flight, the unmanned Apollo spacecraft reentered and proved that it could survive the intense heat generated during a high-speed return from the moon.